Modified tambour finished in rich Copley Mahogany with exquisite ebony and maple fan marquetry across the front of the clock on each side of the dial. A rich arch molding graces the front and sides of the case. 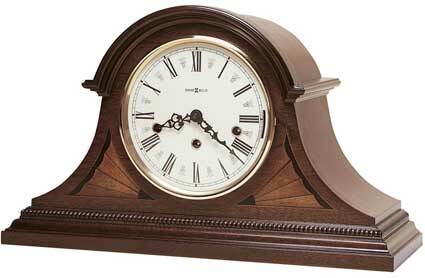 Cream colored dial offers black Roman numerals is easy to read from a distance. Beaded dentil molding adds character to the strong plinth base. The Downing uses the premium Kieninger SEW01 triple chime movement that plays Westminster, Whittington and St Michaels chime melodies with quarter hour movement. Made in Germany. A Swiss style escapement with 5 jewels for accuracy and six Aeterna bronze bushings to reduce wear over the decades. You select the melody from a lever on the front of the dial. Size: Height 10-3/4", Width 18", Depth 6-1/2"
Clocks for sale at The Clock Depot including the 613-192 at discount prices.